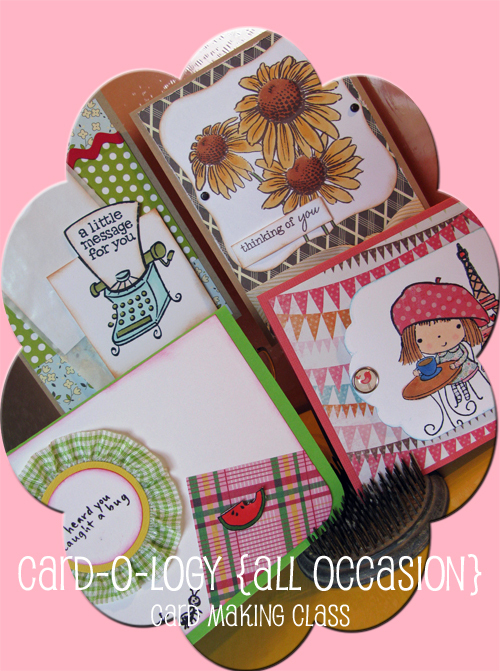 Paper Made Bakery is proud to carry Lawn Fawn photopolymer stamps! 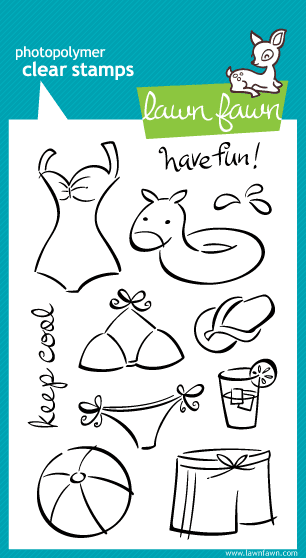 Lawn Fawn is a small company in Orange County that specializes in clear stamps that are fun and lively. They began in March 2010 and since then have been featured in the pages of Paper Crafts, CARDS, Take Ten, and Creating Keepsakes magazines. Lawn Fawn stamps are truly one of a kind. All of their stamps feature original designs that have been created just for you; even their fonts have been customized to perfectly coordinate with each set. And to give you the best stamp experience possible, Lawn Fawn stamps are manufactured in the USA with high quality photopolymer. I'm so thrilled to be able to offer you these stamps -- they really do stamp like a dream. 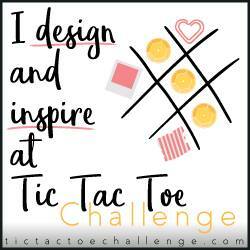 Click here to grab some of these awesome clear stamps that are cute, whimsical, and even a bit quirky -- but one thing they all have in common is the ability to inspire creativity in everyone. These stamps can’t wait to jump start your next craft project! Sunshine, good times and paper crafts -- all anyone could really ask for, right? To help you get into the mood for some serious fun, Paper Made Bakery is kicking off the season by offering the first in their card-o-logy workshops, a series of card making events where all levels of paper crafters will enjoy learning lots of new and trendy techniques, try out the latest and greatest tools, and use loads of new products from some of the industry leaders! The kick-off event is Wednesday, April 20 at 11:00 a.m. and even includes a delicious little lunch. All the product you'll need to complete five handmade cards, including envelopes, is provided in your class fee of only $25 -- even lunch! The designs allow for customization, so you can tweak them to fit your needs -- even the insides are creative! You only need to bring a basic tool kit, a variety of adhesives and your smile! To register for the event, click HERE. Space is limited and will be filled on a first come, first served basis. Can't make it to the event but want a complete kit to make at home? Add that note at check-out. Don't miss out on this fun-filled "inaugural" event! Oooo la la, happy birthday Kate! 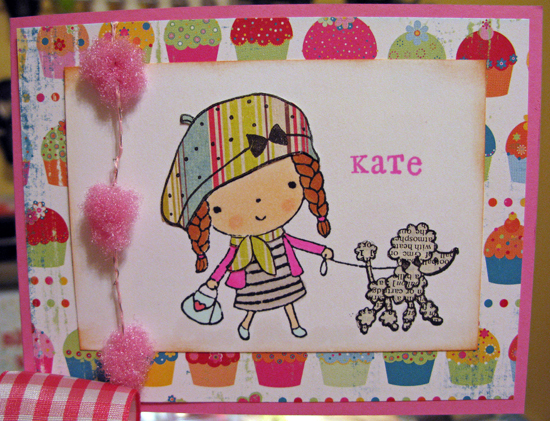 I have a little friend named Kate who is as crafty as her Auntie Shan. When her mom came to San Diego to visit me last week, we had to stop by Paper Tales where I noticed a sweet little card made by Michelle with a new Penny Black stamp set called Mimi in Paris. The clean lines, "Copic colorability" and paper piecing possibilities made me drop the stamp set onto the counter right away. Mimi reminds me of Kate, so I rustled through some scraps, grabbed some May Arts pink fuzzy pom poms (34622) and created a little birthday card. Happy birthday Kate! It's officially spring, so I've created this bright and cheerful banner, which is inspired by the May Arts ribbon company's call for a guest designer. May Arts always has the most gorgeous, high quality ribbons and I love having scads of them handy when creating because there are zillions of interesting ways to use ribbon in all your projects. This Hello, Springtime Banner is also an ode to April's Earth Day celebration and our need to "reduce, reuse, recycle". I've reused paperboard drinks coasters from local pubs/restaurants as the banner's background panels. They're about four inches and perfect for a sweet little banner like this! The patterned paper I chose is from the new line by Cosmo Cricket called "Upcycle", with loads of happy colors and just a twinkle of girly goodness -- florals, purses, and other retro tidbits. I even reused curtain rings with clips to hang the banner, decorated with satiny checked ribbon! 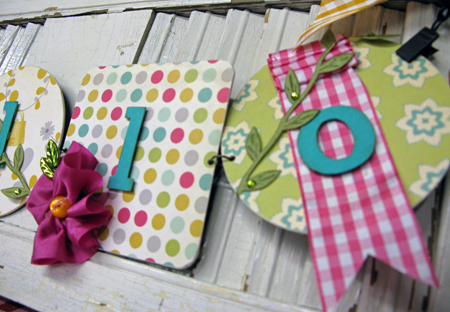 This banner is easy to make and you can find a tutorial by visiting the May Arts blog around April 11. If you love this project and want an easy-peasy kit (filled with everything you'll need including photo instructions) sent right to your doorstep, the Hello, Springtime Banner kit can be purchased at Paper Made Bakery. 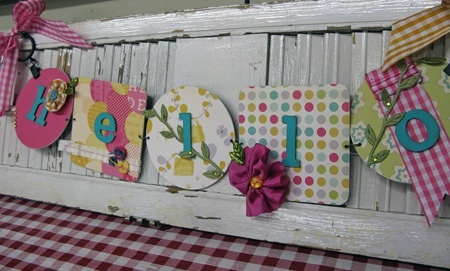 Catch a breath of fresh air and be inspired by this happy, crafty project -- enjoy!